According to OECD, qualification mismatch in the Czech Republic reaches 16%. Qualification mismatch describes a situation for which a worker has qualifications that exceed or do not meet those generally required for the job. 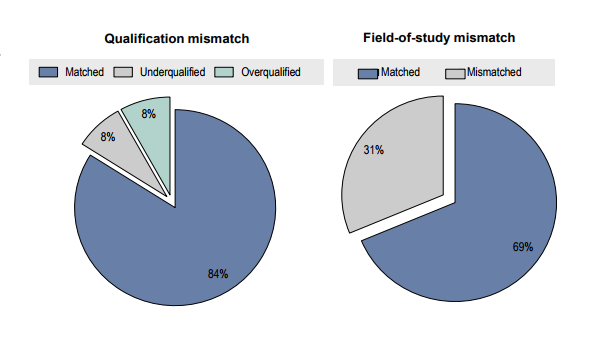 Field-of-study mismatch reaches 31%. This is a situation when workers are employed in a different field from what they have specialized in. In the Czech Republic, the OECD says, for example, Sales workers could move relatively easily into personal care workers jobs with moderate training in process skills (e.g. critical thinking). Read more in a country profile.